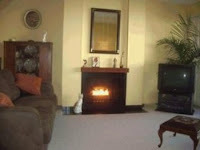 For most of us, a fireplace is more a visual statement in a room then it is a primary source of heat. Can you imagine what it must have been like back in the days of castles, knights and damsels... heating large stone rooms with massive fireplaces, all the heat going up the chimney, the rooms constantly smokey. Thank goodness for central heating. A few years back I had the pleasure of visiting Leeds Castle in Kent, England where I saw these amazing fireplaces! This beautiful castle, built by King Henry the VIII, was originally a hunting lodge so the rooms were smaller and likely easier to keep (somewhat) warm. As lovely and romantic as these rooms and their fireplaces are, I think layers were in order on cold winter days! Now, one would assume that with the recent completion of Kate's fireplace, and with the current topic of my post today, I have fireplaces on the brain :-) Well, maybe! HaHa!! Actually, I'm responding to Paul Anater's request that I explain how the facade was put together. (Paul is a professional kitchen designer and hosts a great blog called Kitchen and Residential Design... I suggest you check it out!). For all you craftsman like Paul, and for all your amateur tinkerers like me, scroll down to the end of this post to find that explanation. This first photo shows the after of a quick and easy make-over... we were selling Brian's condo and had to fix it up, fast! The tile surround of this fireplace was 80s pink. Ugly!! To bring it up to date, I simply primed and painted the tile in a semi-gloss black. What a difference! 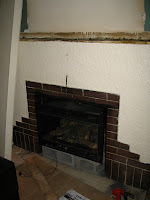 Our next fireplace was also stuck in the 80s with flesh-coloured marble tiles and brass vent slats on the gas insert. I removed the offending tiles and retiled the face of the fireplace in a beautiful slate (Desert Sand). Then, to modernize the vent slats, Brian spray painted them in black BBQ paint. 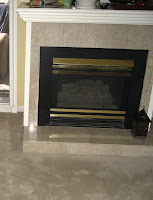 A relatively easy makeover with fantastic results! Now... for those of you interested, explanation time! Of course, everything started with Bob coming in to measure this superwall! I don't have much in the way of drawing skills (but I'd better hone up on that!! ), so I explained what I wanted from Bob and showed him my inspiration photos. He came back with a pretty-close-to-perfect rendering of what I wanted for Kate's fireplace. So... all was a go. Overall, the installation was relatively straightforward... although it did take longer then anticpated. Bob used fir sheeting, 5/8" thick for the job. Everything was built, stained, and lacquered at the shop... Tyler built the boxes that would fit around the "pillars" and he prepared the back (cladding the inside of the nook) sections separately. Along the bottom and top edges of each piece, Tyler routered a section aproximately 1/4" down and 1" wide. This is where the 2" stainless steel strips would be glued. Once on site, Tyler dry fit each piece and made necessary alterations to the pillar pieces to accommodate the uneven brick wall (see picture 1 and 2 above). Once a pillar piece - and its corresponding pillar piece - fit, he attached the back section. He then slid it into place, securing it to the section below it by using biscuits to ensure a good, strong connection. Next, he screwed the full section to the wall along the area that would be covered by the stainless steel strips. The final step was glueing the stainless steel strips into place. If you've read to the bottom of the page, thank you! Victoria you rock! Thanks for the explanation of the fireplace construction and thanks for the shout out. Now that I can see that beautiful fireplace going in, it makes perfect sense. kudos on your and your husband's handiwork too. You two do beautiful work!